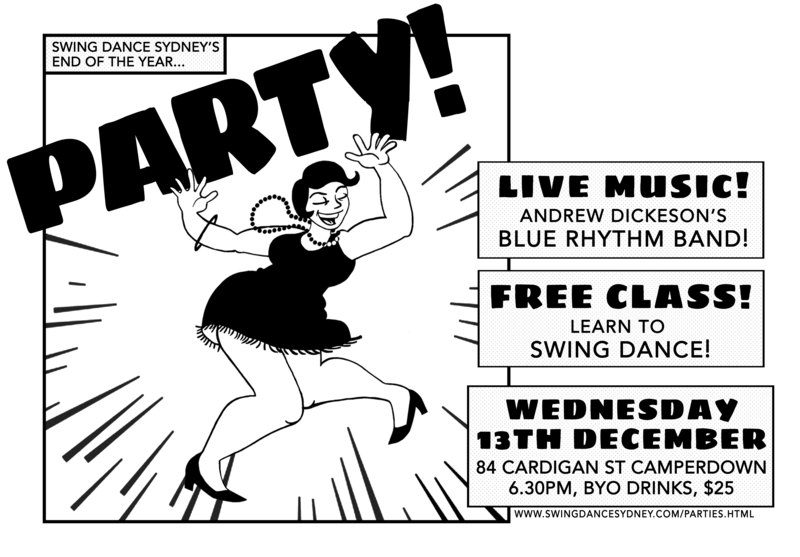 Next party: Swing Dance Sydney End of Year Party Andrew Dickeson's Blue Rhythm Band (13 December 2017). Let's celebrate a whole year of lindy hop and jazz with more lindy hop and jazz! A live band - Andrew Dickeson and his Blue Rhythm Band! All at the hall where we usually teach classes on Wednesday. That means lots of room to socialise, but it does mean BYO drinks :D Bring a few cookies or some sort of snack to share. No time to plan? That's cool - bring your appetite! When: 6.00pm Doors open, 6.30pm class, 7.30pm social dancing. Wednesday 13th December 2017. Where: Camperdown Stanmore Community Church Hall, cnr Salisbury Rd and Cardigan St, Stanmore. Don't want to dance? That's cool. These guys are great entertainers, so it's nice just to sit, watch, and enjoy the music.